Intruder 2.0 Mega Truck is One Mean Chevy. In the ever changing world of Mega Mud Trucks it takes a lot to turn heads like this. When Barry Thompson started gathering parts for his new build he definitely kept this in mind. His New Intruder 2.0 Mega Truck is nothing short of Insane Work of Art. Barry and the Crew at L&W Fab started with a Fiberglass 1936 Chevy Truck Body and custom built a chassis out of 1.75 x .090 wall Chromoly to fit. A Nasty Terry Priest Built Big Block Chevy was shoe-horned in between the frame rails. This Blown Alcohol Injected 540 Engine makes over 1500 Horsepower at the crank. All of that power is transferred to the Massive BKT 14.9 x 24 tires mounted on custom steel wheels through a FTI Band-less 2 speed power glide, a SCS transfer case, and a Custom set of Meritor Axles. The Plentiful Horsepower and Bulletproof parts help this mega truck air it out off of the jumps. When it lands 20″ Scott shocks pull dampening duty as the massive 5,980 pound truck returns to Earth. We caught up with Barry and this one of a kind mega mud truck at Rush Off Road Park during the Mega Truck Series Event and boy did he put on one heck of a show. 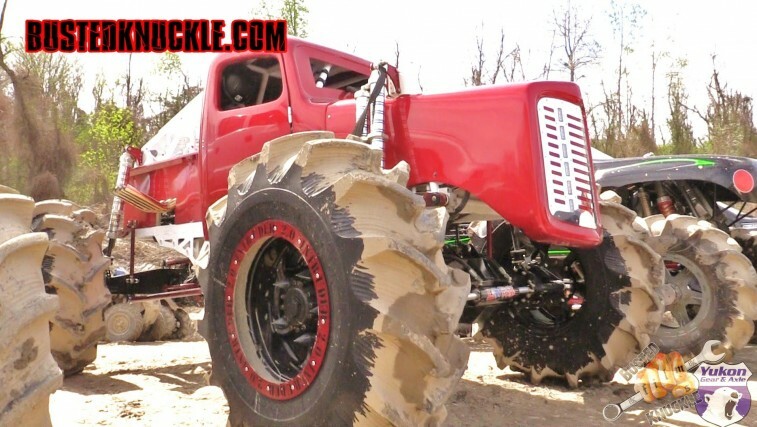 Check out more videos of the Intruder 2.0 Mega Truck on the Busted Knuckle Video Youtube Channel.